So that morning before we left Manhattan, we opted for one last stomach hurrah. Having slept at 4 and getting up at an ungodly 7, we embarked to Chinatown for some early dim sum; you see, we try to be efficient and stuff as much food as possible into our brief time in the city. However, we came to discover that Chinatown itself did not officially wake up until 10:30. Being that it was freezing with windchill, we proceeded to sit in a McDonald's, the only place open. I munched on an egg McMuffin, officially the first time I've had McDonald's in years. I savored every bite, knowing that I will probably not wake up in time for their breakfast menu for more years to come. 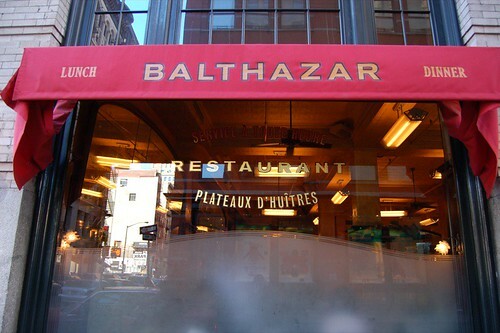 After trying unsuccessfully to sleep over the noise of the unruly pack of hoodlums twice our age, we headed to Soho for Balthazar. Arriving at 9:30, the place was barely full. Being that we were still on the breakfast menu, we decided to brave the half hour transition into brunch hour. 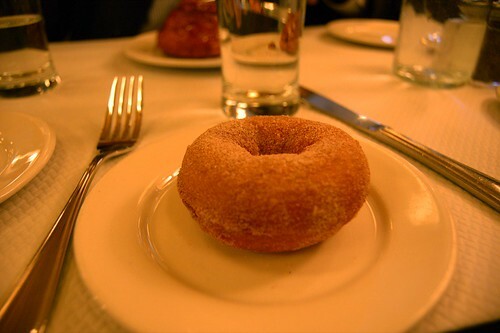 I munched on a powdered sugar doughnut, which was wonderfully nutty and not too sweet. 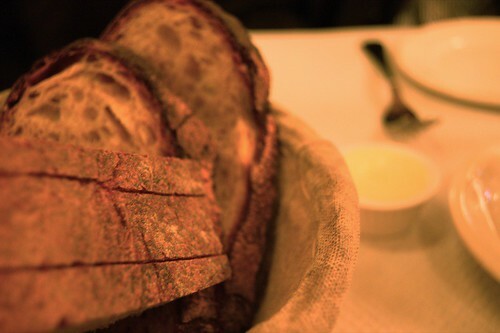 I also likeed the slightly crispy exterior. I do not remember the last time I ate a doughnut with a knife and fork, but it somehow worked with the atmosphere. 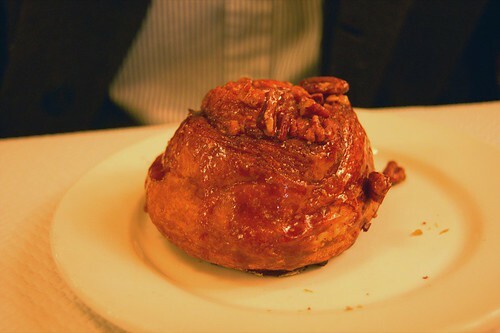 N decided to have a sticky bun, which was good, but a bit too caramel-ly for my taste. Soon enough, the clock struck 10, and we were given the brunch menu, along with some glorious carbs and butter. Knowing that we would go on to consume other baked goods later, N and I decided to share an eggs florentine. 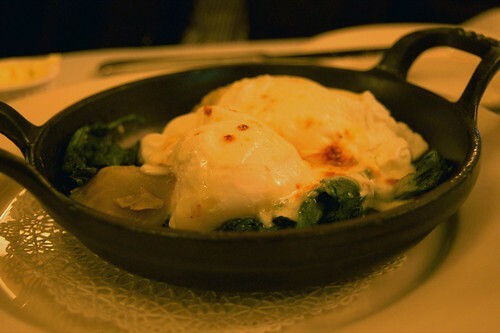 Two perfectly poached eggs atop boiled spinach and artichoke comes slathered in a baked and creamy hollandaise sauce. While the eggs were wonderful, I wish there were more and that I had more carbs (i.e. an english muffin) to go with it. Next time, we'll return for a fuller lunch/dinner. For the past year, congeries of women in Ugg boots have lined up outside a chain of shops called Pinkberry to get a taste of Los Angeles’s newest take on the airy, low-fat treat of yore. This is a very timely post, admist all the controversy surrounding the chain. 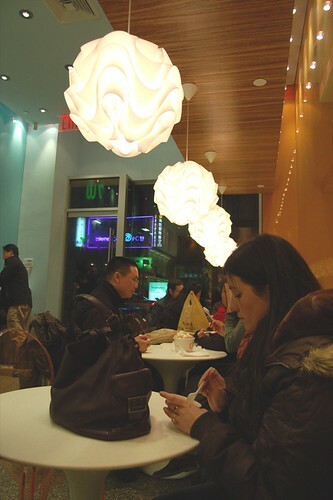 After our dumpling session, we proceeded down the street to the popular fro-yo maker, whose addictive yogurt is considered by some to be "the taste that launched 1000 parking tickets." 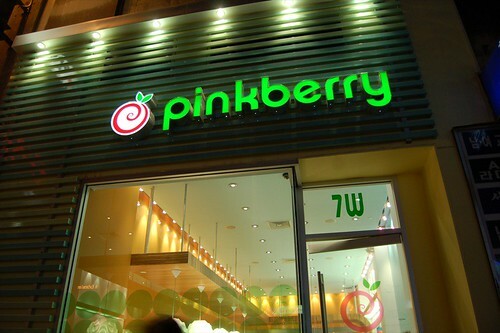 A favorite of celebrities, among whom include Paris Hilton, Pinkberry has stirred up quite a bit of trouble in LA -- episodes including a menacing threat, a lawsuit, and a gazillion parking tickets, among other things. The original started in West Hollywood, but three have since sprung up in New York. The store is very secretive about operations. The sign on the door prohibits pictures, and I was unsuccessful in getting interior pictures last time I visited. This time, however, I managed to steal a couple shots, though I still have yet to take pictures of the actual toppings. Another shot, for good measure. The fruit toppings include mangos, blackberries, raspberries, blueberries, mango, kiwi, strawberry, and bananas. The more "inspired" toppings include oreos, chocolate, Cap'n Crunch, Cocoa Pebbles, granola, and nuts. While the fruit was a nice touch, I could've just gone for the yogurt plain. If there were one thing I could complain about, it would be the hole in the middle of the cup. I dislike how the workers just fill up the cup around the perimeter, leaving a gaping cylinder of air smack in the middle. I want my yogurt, dammit! They also offer the ambrosia in green tea, over which I did not fawn. It was softer and grainier, and considerably less addictive. They also offer smoothies and shaved ice, but I was too keen on getting my yogurt to try them this time. Already, I'm suffering from withdrawal; thank goodness I will be working in the city this summer. So forget what I said about no Manhattan posts for a while. This weekend was sell day for most banks, so there were many a soon-to-be banker enjoying the all-expense-paid hedonism, the fruits of a grueling interview process. I hopped on this bandwagon and was convinced by N, that I, too, deserved a weekend in the city. And what better way to start off the adventure than a dumpling gorging session? 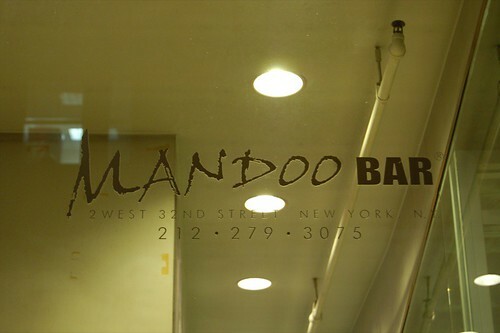 A and I headed down and met N and S at Mandoo Bar in Koreatown. Except that, there were a series of buildings with the same address, and we found ourselves standing inside a closed office complex wondering what the heck was going on. Turns out we only had to walk 10 more feet to find the place. What smart cookies we are. It seems like the entire dumpling operation is run by this woman. 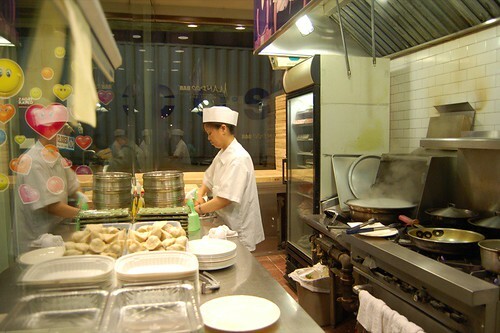 I admire her skill in not only making the dumplings from scratch, but boiling/frying them to order. 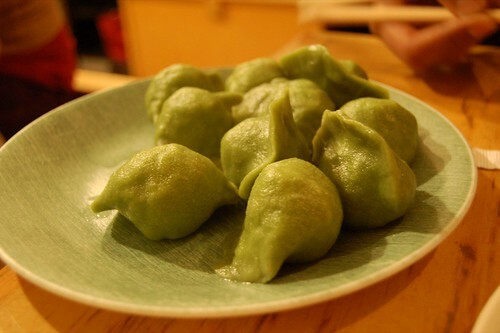 Amazingly enough, our dumplings only took a few minutes to come out. She's the poster child of efficiency. 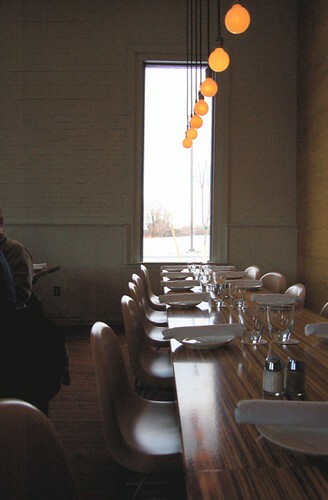 Pretty narrow space, minimal decor and simple wood tables. The place was packed and we were hungry, but we survived the 15 minute wait. 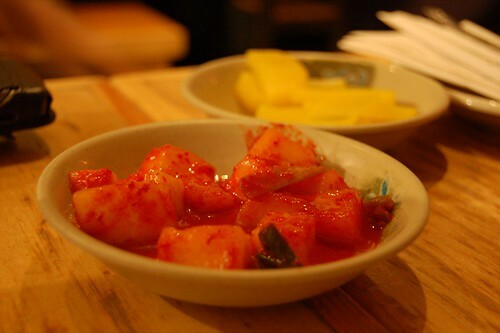 We started off with some pickled and kimcheed radish. 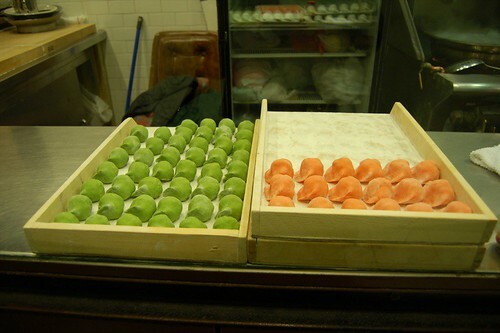 These were some of my favorite dumplings that night. 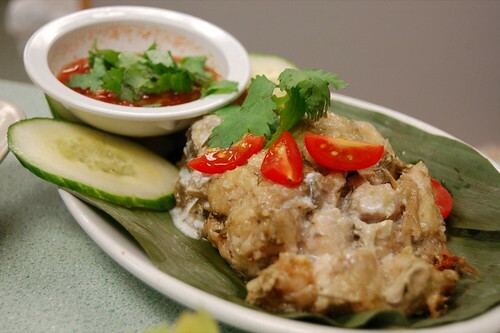 The crispy, slightly chewy, browned dough enveloped juicy pork and green onion innards . All was well until I realized that I had given up pork for Lent, but these were so good I continued eating them anyway. 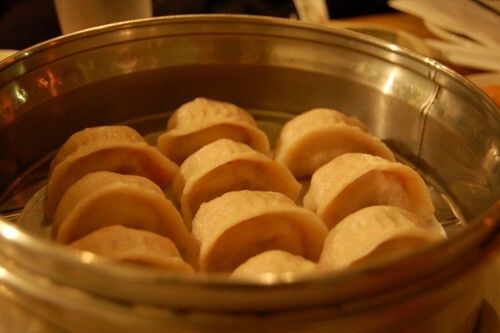 These dumplings were also quite good, though they required more of a workout for the mouth. The chewy wrapper housed some minced pieces of cucumber, carrots, sprouts, vermicelli, cabbage, and onion pieces, which were healthful but a bit too bland. They could not compete with the peppery delicious vegetarian dumplings at Din Tai Fung. Another favorite of the night were the kimchee mandoo. 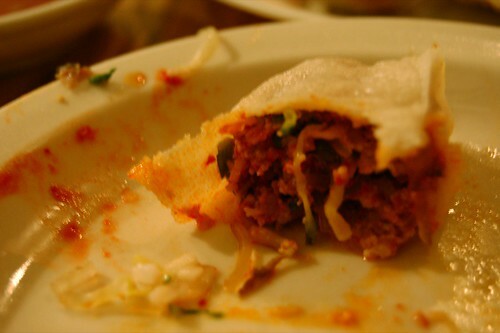 A softer wrapper contained a delicious mixture of kimchee, pork, and vegetables. Spicy and amazingly addictive, I continued to consume these until my tongue started to sting. How sightly! The picture really doesn't do it justice. The seafood mandoo turned out to be a disappointment. It contained mostly minced surimi and small pieces of shrimp, but tasted entirely of the surimi. 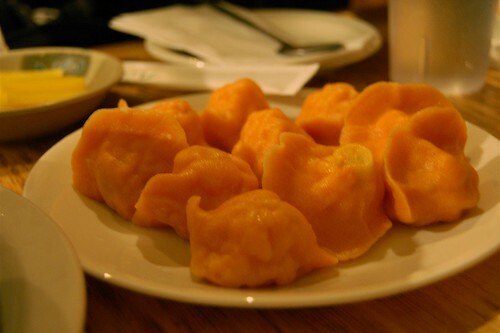 This made the dumplings a bit too sweet, with little flavor variation. 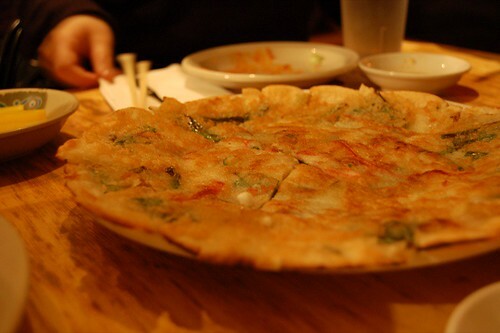 The pajeon was also a disappointment. The texture was a bit off, as the center was extremely chewy, sort of like a Chinese rice cake. The edges, on the other hand, were crackerlike and thin. Flavorwise, it lacked depth since we couldn't really taste any hint of seafood. 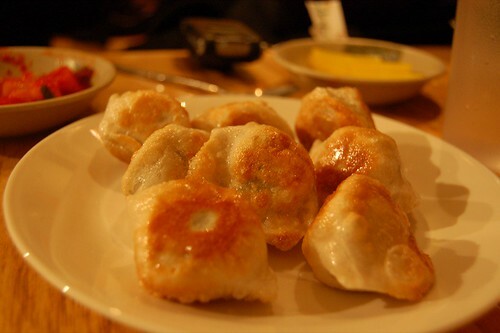 Next time, I'd skip the pajeon and head straight to the dumplings. So while the city of Ithaca is snowed in, and classes are cancelled for what seems like the first time in school history, I will use my time productively to update this site, instead of, say, doing homework. So one day, I am minding my own business, when I get an email from the famed Bollywood star, N. He proposes a lunch with a couple mystery guests (recipient list suppressed through the nifty Bcc: feature). Now, one does not turn down an opportunity to dine with N. The degree of his fame is unfathomable; in fact, I cannot even wrap my simple mind around it. So last Saturday, I decide to wake up before noon and embark on this adventure. I walk down College Ave. and climb into a dark SUV, consisting of L, C, D, and N himself. I feel as if I have just walked on a proverbial icy red carpet, all the while shunning the papparazzi who are compelled to snap photos with flash, even in the blinding Ithaca sun. 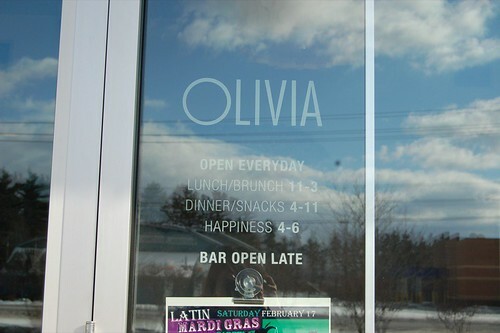 We drive down one long road, and finally arrive at Olivia, where the only other patrons are around 40 years older. I feel right at home with this crowd, who are half drunk on their mimosas. My only life aspiration is to be invited to dine with this vibrant, rebellious crowd. Although we are only a party of five, we decide we are ballers and order nearly everything on the menu. I was quite excited to see these Puruvian pockets of beef on the menu. However, I was disappointed to find the filling crumbly and dry. The beef could also have been marinated more; I would have liked to rely on the filling for flavor rather than the barbeque sauce, which was too salty. This interesting sounding menu item was less tasty than I anticipated. 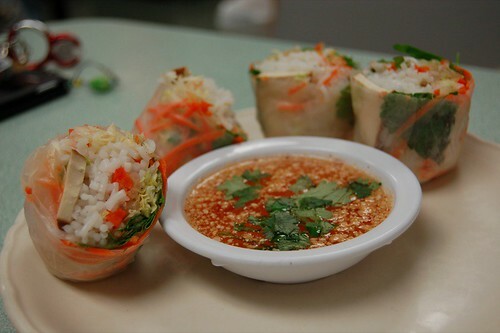 Unseasoned sticky rice comes wrapped in a thin layer of fried batter, drizzled with a soy wasabi vinaigrette. The dressing, though less spicy than desired, was fine, but did not adequately season the puck of limp, white rice. Even sushi rice or something could have worked better here. This was the best appetizer of the three. 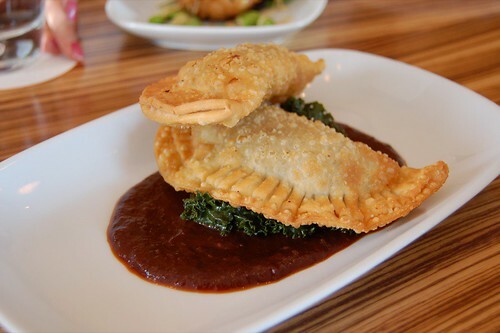 What is not to love about some warmed, gooey cheese? Apparently nothing, because Naveen started to eat his brie straight up, with only sprinkles of crostini. Entrees fared better than appetizers. 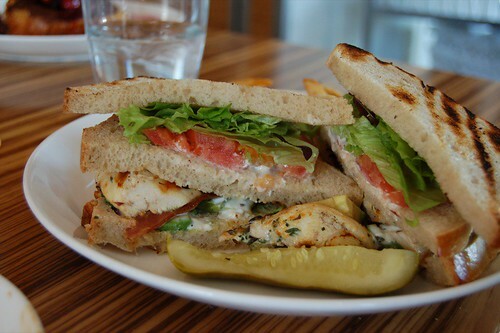 The chicken club was standard but solid, with some moist, lightly flavored chicken with crispy bacon and a cheesy condiment on not one, but two slices of bread. 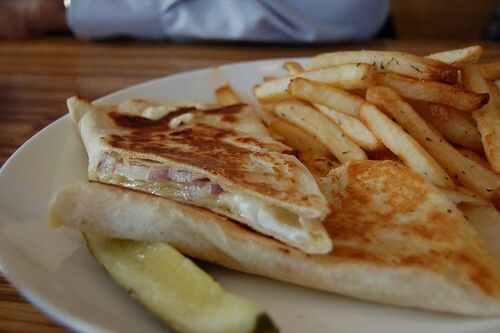 Naveen, lover of cheeses, decided to go for none other than the three cheese panini. It surely was cheesy, which made the panini too salty, with little bread to balance. I would have preferred this using the rolls that Whole Foods uses in their paninis. I assume with your attention to detail, that you have also noticed the fine arm of N. Now as I pull up my mental photo album of bank logos, his shirt color matches up exactly with GS's soothing yet classy soft blue. Well played, N, well played. This was perhaps my favorite sandwich of the day. 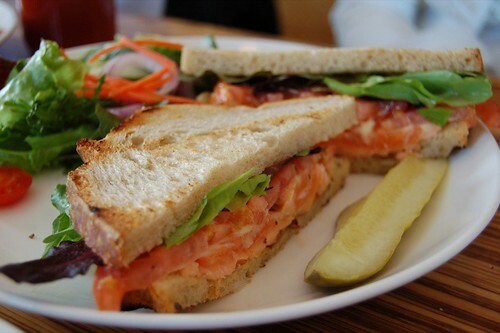 Barely cooked, creamy salmon comes with crispy bacon sandwiched between soft, grilled sourdough for some nice texture contrast. What I liked most was that I got to taste every ingredient, especially the salmon, which was wonderfully undercooked. 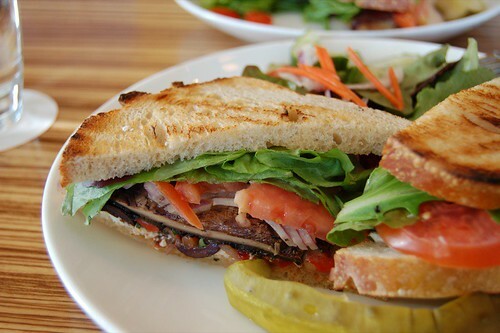 The portabella was pretty standard, though I would have liked more mushroom to balance out the salsa and feta. The thin slices did not suffice against the overload of parsley and onion. 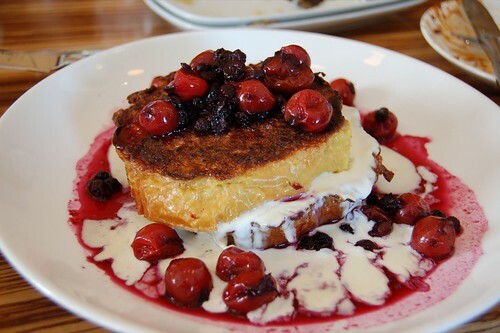 We opted for one brunch item, and the french toast turned out to be quite decent, but it was lacking that delicately crispy exterior that Canteen does so well. I did enjoy the sour cherries, though. As if we hadn't eaten enough, we asked for desserts, as per the baller style. 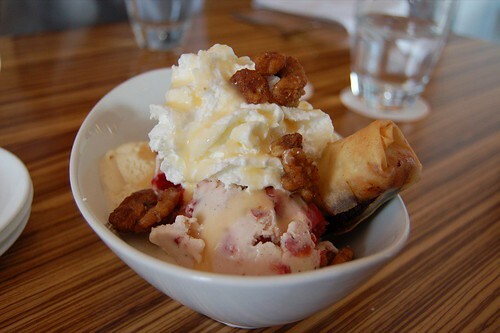 The banana split comes with scoops of sour cherry and toasted marshmallow ice cream, candied walnuts, and a chocolate and banana spring roll. I was not too big a fan of the spring roll, which seemed superfluous and random being paired with sour cherry. Pleasantly, this "ice cream" turned out more to resemble sorbet, but I found myself avoiding huge pieces of hard, frozen cherries that were difficult to eat. It looks small, but packs in a bit of flavor, reminiscent of my pot de creme I had at 1550 Hyde. The chocolate, though rich and smooth, could surely have been more bitter. 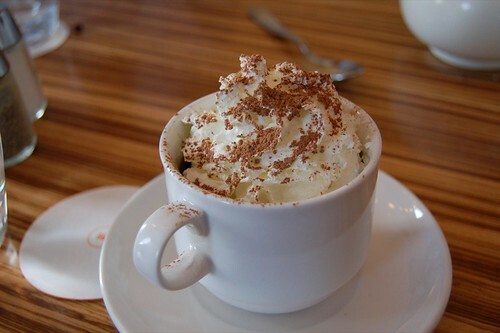 I also would have liked some creme fraiche instead of out-of-the-can whipped cream. 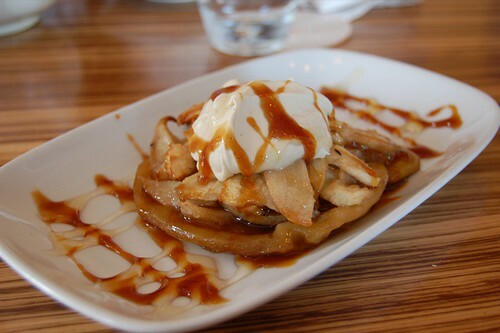 Along with the chocolate pot, the apple tart was one of the dessert specials of the day. I was disappointed to find the tart itself limp and undercooked, and the apple slices too soft. The caramel and honey were also a bit too much for this already sweet tart, which was noticeably absent of any thyme accent. Unlike the pot of chocolate, this was a miss. 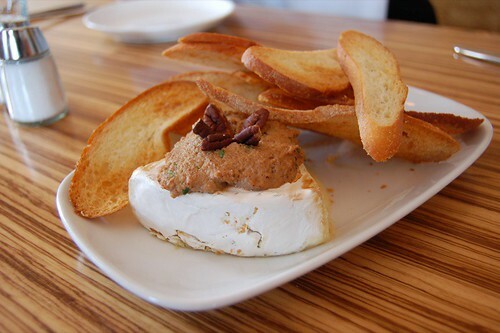 Before I move onto my backlog of Bay Area restaurants, I am going to review a few restaurants around here (Ithaca). Not too much has changed, except for a burrito place and Starbucks. Having tried a chicken burrito from "That Burrito Place," I can't say I was too impressed. The rice was clumpy, the chicken too dry, and salsa lacked soul. It did, however, knock me out for a good 3 hours or so, and I woke up lethargic and slothful. In any case, I am glad that there exists another reason for me not to consume my abysmal creations. It is also about time that a Starbucks opened in Collegetown. As much as I am a champion for small businesses, I also support enterprises that improve my quality of life. Now all we need is some sort of gourmet grocery and/or a fish monger, and I will have one less thing to complain about. Now moving on. 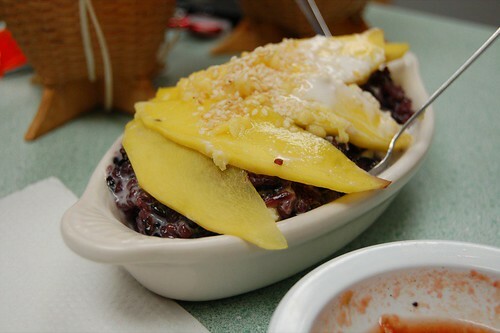 Sticky Rice is one of those establishments that you would never expect to have a website. Situated in a back alley adjacent to a Domino's, one would more likely expect to find shady dealings, because Ithaca is a haven for tomfoolery. 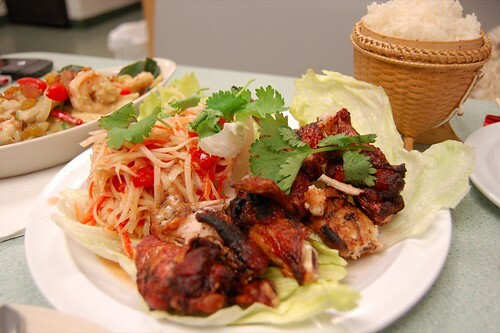 The restaurant has an amazingly limited front-of-house, and mostly does take-out business. These rolls were good, mostly for the reason that they tasted exactly like what you would expect. The only problem was that sauce was a bit too saccharine. The shrimp green curry was one of the better things we ordered. 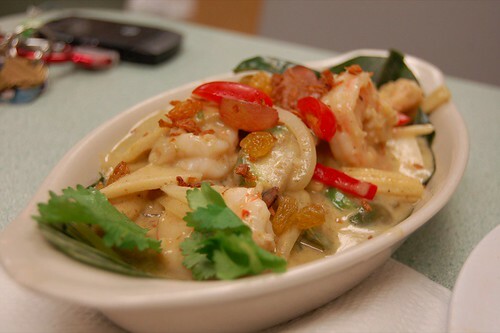 The shrimp was crisp and fresh, and came with an abundance of lime leaves, basil, red peppers, and onions. The curry was well-balanced and flavorful, but I felt that this dish was slightly sweeter than I preferred. I suspect it was the sweet potato, which made the curry a tad too sweet. I wasn't too fond of this entree. We were given little bits and parts of an anorexic chicken, and ended up with a combined 2.5 cubic inches of meat or less. I gave up on the literal skin and bones, and moved onto the papaya salad. The salad consisted of shredded green papaya and plum tomato halves, doused in an overwhelmingly unbalanced fish sauce that was both too sour and salty. I would have also liked some peanuts as an accent. This was an entree that was recommended by our server, so we were surprised when this turned out to be the worst thing we ordered that night. The marinated pollock came steamed with coconut milk in a lime leaf, served with red curry sauteed with garlic, ginger, cilantro, and onions. There were just too many flavors competing, and every flavor clashed with each other. The pollock was already flavorful and (too) savory, having been marinated in a pungent spice. The coconut milk was not a tactful pairing, and the curry just served to compound the saltiness of the entree. This dish just tasted plain confused. This is perhaps still my favorite dish at Sticky Rice, and I have made up my mind that the place is only worth visiting for the curries and dessert. I always order the purple rice, which arrives chewier and drier than your average Thai restaurant because they steam it in the Laotian tradition. Mixed into the rice are crunchy toasted rice pieces, contributing to some interesting flavor contrast. Topped with mango, toasted sesame seeds, and sweet coconut milk, this is a comfort food that qualifies as one of my favorite desserts. 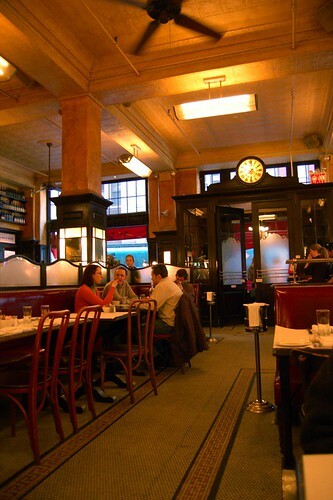 This is going to be my last Manhattan post for a while. However, as I will be spending my entire summer there, I foresee a backlog of New York posts to come. 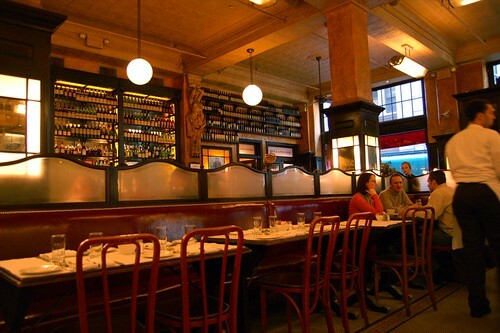 After the Grimaldi's excursion, we headed back to lower Manhattan, and decided we wanted some warm and hearty grub, sans reservations. And since all our structured plans revolve around food, we decided to hang around the East Village until we got hungry again. Of course, that doesn't take much work--we're bottomless pits. 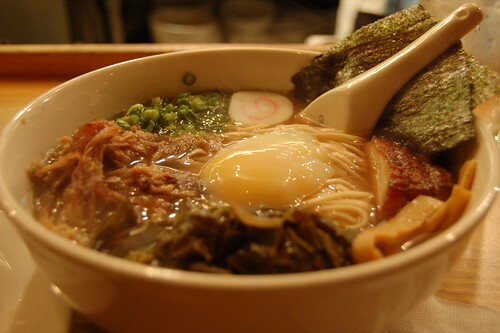 I have been looking to try Momofuku for a while now; it's received quite a bit of press about its noodles and more importantly, the Berkshire pork buns. You can't go wrong with pork buns. Unless you're kosher. 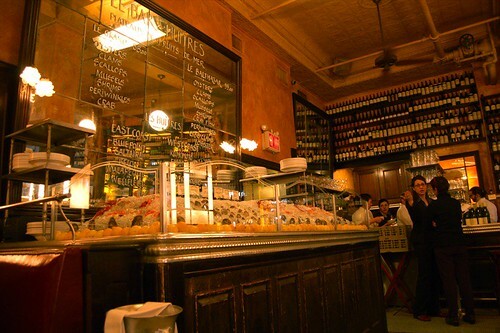 It was a rainy Sunday night, and we find ourselves waiting inside the very narrow restaurant. It's a minimalist space, covered in light wood. 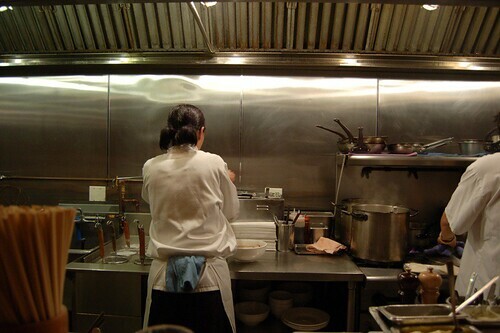 The main attraction is the kitchen, along which patrons sit, uncomfortably, at the bar. Getting to the bathroom is nearly a BMI test, as you slide along the little space between the wall and customers. 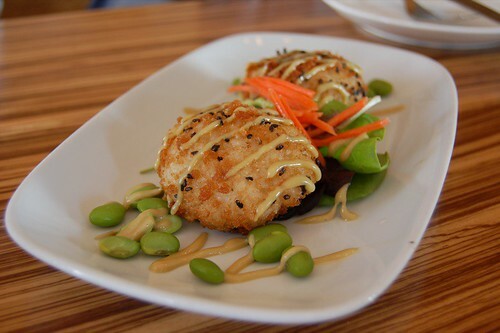 We started off with some rice cakes, which resembled the popular dim sum item, XO-sauce roasted rice rolls. 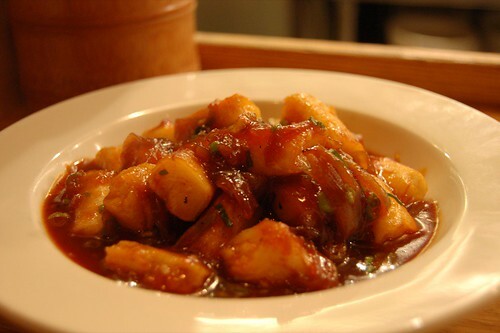 These rice "cakes" are similarly pan-fried and mixed with sauce. However, these were slathered in an overwhelmingly sweet, rather simple variation of hoisin sauce. I got tired after them after around 3 rolls. I was hoping that we would fare better with the signature pork buns. 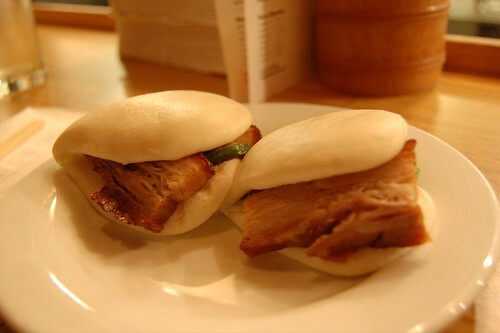 Unsesasoned pork belly comes sandwiched with cucumber slices and a dollop of hoisin sauce inside a steamed sweet bun. Honestly now, what is the big deal? Basically, you derive all your taste sensation from the pork fat. I was expecting something like delicately seasoned and jerked pork. The pork belly thing has been a recent trend to reach the mass Western palate, so I guess people are still enamored. Hurrah for groupthink. I beg to differ. The noodles do in fact need to be firmer. My noodles arrived limp, in a one-dimensional broth that lacked depth. Even this could not be reconciled by the toppings, which I did end up enjoying. The non-pork belly shreds were well-seasoned and tender, and the poached egg was a fine one. Though when I prodded it, it wasn't as glorious an affair as one would expect (have you ever read a more embellished review?). 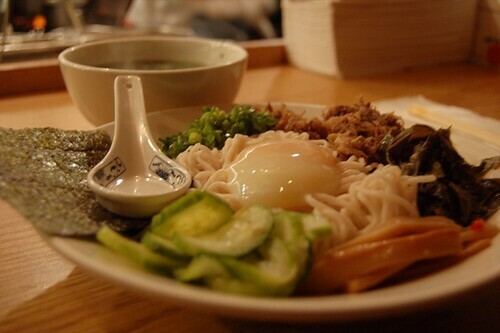 Jean ordered this cold somen, which was reported to be submar. Again, the broth was lacking dimension; and its being cold just made it a more abysmal affair. 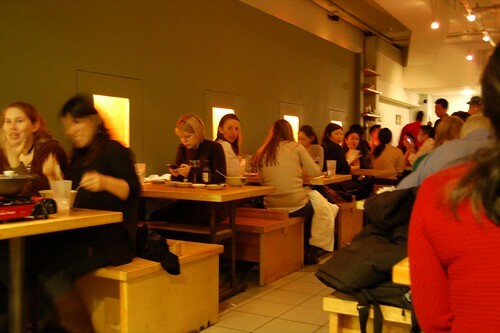 My experience at Momofuku was an utterly lackluster one. I really wonder what the reviewers were eating.